You can click the photo to add or remove frame. Turn designs, photos, and text into a great game with customisable puzzles! Vibrantly printed with vivid and full colours. You can now enjoy hours of puzzle enjoyment with your loved ones. Give a custom puzzle as a gift today! Can be printed with any pictures as long as it can be designed in the computer. - A5 Size - 80 pcs (21cm x 15cm) / 8.3" x 5.9"
- A4 Size - 120 pcs (28cm x 20cm) / 11.0" x 7.9"
- A3 Size - 300 pcs (39cm x 28cm) / 15.4" x 11.0"
- A2 Size - 500 pcs (50cm x 38cm) / 19.7" x 15.0"
Material: Sturdy cardboard and mounted on chipboard. Warning: Not suitable for children under 3. Small parts may pose a possible choking hazard. I loved the item that I have purchased from you all. It was just so amazing. Thank you for the amazing puzzle. It is so beautiful. ???? Cushions & Puzzles ?? ?? I ordered a 500 piece jigsaw puzzle. The cardboard used was good quality and the delivery was on time. Great customer service to guide me shop with printcious to create the puzzles. tired abt fixing the puzzle but quite enjoyed it. tq. will buy again. Printed in good quality. Love the end product! The puzzle came with a photo as well Both have nice quality and I love it so much ?? I'm very satisfy with the fast delivery. Great services from printcious within 4 days my parcel has arrived. Thanks to Printcious for these wonderful darlings! ?? Fluffmellow pillow and Breathless puzzle? tq Printcious.. So many items to choose lastly I choose this two products. It's really amazing to give a personalized gift to someone we love as it meant so much. My thanks to printcious for this! I love it and received it safe and sound within few days. Already rcvd the item.. Rcvd item as per order.. Really love it.. Good job Printcious!!! Item arrived in a good condition. The puzzle piece also good. I recommend to use raw image, instead of using editted image. Recommended. Good job. thank you for the awesome puzzle. i love it so much. Really love it..puzzle rcvd as per order.. Good job Printcious!!! Murni baru saje tempah gambar puzzle (DIY) di Printcious..memang puas hati gambar terang & jelas..penghantaran pon sgt cepat.. The puzzle came nicely wrapped and I was delighted to find a complimentary printout photo of the puzzle! Thanks! I am very satisfied with the end product. I will order another Puzzle. Small and cute gift I have purchased. I really enjoyed creating the jigsaw puzzle as a gift. Moreover the steps to put our design together is easy to follow. ?? Printcious..
Good 1. Great service and like the puzzle. Thanks. Good value for money Good product quality Excellent service by seller Puzzle very nice and shinning ?? Hi! Accepted the puzzle you guys specially designed for me and my family <3Thanks for the heartfelt service! Yeayyy my items are here.. The quality is good and I’m satisfied with the fast delivery! best gift ever great job to princious for the excellent work. fast delivery, puzzle is really nice and in a good condition. Good quality of product. The puzzle was so nice and beautiful. Happy for my parcel. Truly love the beautiful puzzle and magnet from Printcious. It was exactly as advertised. The quality is great. Fast delivery. I cannot wait to give it a gift for my boss im sure she and her wife will love it, too. Thank you printcious. The product quality was good especially the glass along with photo frame is protected well. Also the delivery is speedy! Would recommend and will come back for other items. Thanks! I ordered two puzzles as gift for my sis~very nice and my sis like it very much too????? ?Good job and I ll order it again?? I custom the puzzle for my future husband for his birthday,..and he love it so much..The quality is great. The puzzle piece also good. Good job. Bought a customized puzzle and coaster, love it so much! Great service, fast delivery and good quality product! Good Quality . Fast Delivery. Great job from Printcious! Printing was absolutely awesome and puzzle was delivered in just 3 business days after order was placed. I'm very satisfied thank you printcious do keep up the good work ?? My order is super rush which is a day before Valentines. I thought that I would not get the product within the day today as there might be a lot of products to be prepared! Contacted them via FB and they are super friendly and even willing to help me out on such rush order! The item arrived within few hours and I am really satisfied by their service and peoduct! Its my first time using Printcious and definitely I will use it again! Great job Printcious! I am very satisfied with the Birthday Puzzle frame. Worth purchasing. I will definitely recommend this website to my friends. Will purchase more in future. Thank you very much PRINTCIOUS !! my frens like it very much. especially our photo printed on the puzzle. haha, thanks printcious. Fast delivery, and the quality of the puzzle is not bad. The design and color is exactly the same as the template. Well, the delivery is in 1 piece and we want to send to my friend in loose packing. However the cutting of the puzzle is not really completely cut, it’s difficult to tear out and spoil the puzzle. Hope can improve this. Fast delivery ? Ordered puzzle on 27/06/17. Delivered by Ninja on 29/06/17 to my surprise. The product arrived in good condition, quality, good service & great discounts. 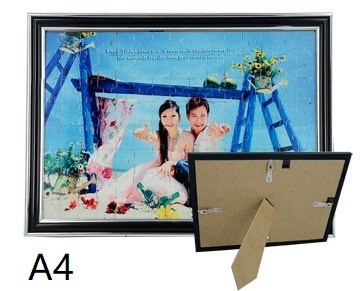 Ordered a Photo Puzzle for Anniversary Gift. As I'm not around Malaysia worried it wont arrived on the date I wanted but still it was delivered on time. At 1st i received a not so good printing quality puzzle for this order. Hence dropped a message to printcious customer service, Henry Tong assisted one my case. Immediately I received reply that a new puzzle will be send to me! I was very delighted with their fast response & assistance! Great product , great team!! Good & Clear Printing. Fast delivery . Good job printcious ! Nice printing quality ! and fast delivery service ! Thank you so much ! I have ordered two item which is custom made pillow and also puzzle frame.. both are so beautifully done. Good I love it?????? thank you printciuos!!!!!!!!!!!!!!!! !